Persimmon seeds show a spoon-shaped embryo which means wet, heavy snow this upcoming winter. According to Pathways Alternative School Principal, Ms. Sharon Lindsey, and The Old Farmer's Almanac online, winter weather can be predicted with persimmon seeds. For at least seven years, Ms. Lindsey has tested the persimmon seed winter weather folklore with students and has found the winter folklore has been fairly accurate. Again this year, using persimmon seeds from Panther Creek State Park, Lindsey helped conduct the winter weather folklore experiment with the middle school science class. Ms. Lindsey said after cutting the fruit open, the students first looked at the fruit, the seed, and the embryo under the microscope. The result—a spoon-shaped embryo—meaning lots of heavy, wet snow will fall. 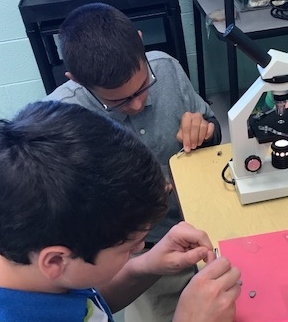 Science class teacher, Ms. Lisa Mullins, said the students enjoyed taking the persimmon seeds apart and viewing the embryos under the microscope. 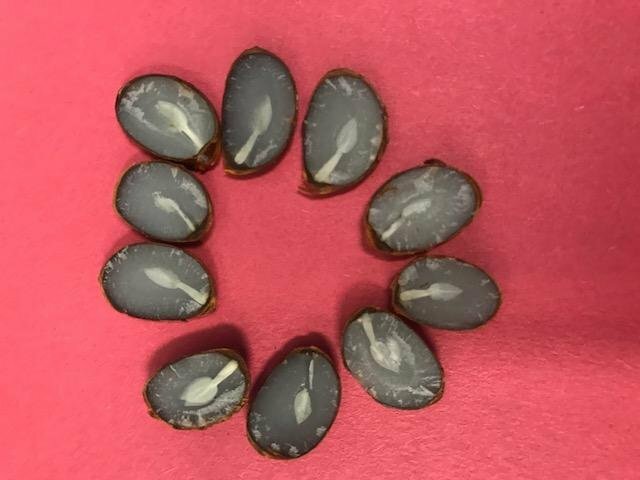 In addition to spoon-shaped embryos, other winter weather circumstances can include a light snow and a mild winter if the persimmon seed‘s embryo is fork-shaped or icy, cutting winds if the embryo is knife-shaped. Mix together the persimmon pulp, sugar and eggs. Mix baking soda with buttermilk and add to mixture in bowl. Melt margarine in baking pan and add to mixture. Sift flour and baking powder together and add alternately with cream or milk. Add cinnamon and mix well. Fold in the additional 2 Tablespoons persimmon pulp. Pour into 13 x 9-inch metal pan and bake at 350 °F for 55-60 minutes. Be careful not to over bake. Middle school science students examine persimmon embryos.